Back in November I signed-up for a FREE Gymboree Play & Music trail class on their company website (specifically, a “Play & Learn level 2” class). There is a Gymboree is located within walking distance from my home, but even if it wasn’t, it is totally worth the drive to attend their programs (especially during the winter months)! As an elementary teacher, and a former children’s dance and swimming instructor, I like to think I have HIGH expectations for these types of programs. Gymboree has definitely met them! They offer different class levels ranging from birth to 5 years. Each level is tailored to the abilities of the age group (e.g., 6-10 months). The instructors are super enthusiastic and knowledgeable about child development; each week they lead a discussion on how to help your child (e.g., with teething, eating solids, etc.)! Every class has a specific skill focus (e.g., crawling, sliding, experimenting with musical instruments and sound, etc.). In addition they use fun props such as bubbles, parachutes, stuffed animals, inner tubes, and different equipments (e.g., padded tunnels, balls) during the class! Watching my daughter play at Gymboree is awesome; she is becoming an independent little mover likely due to the fact that the whole room is a colourful padded jungle gym! I LOVE that Gymboree is located in 33 countries around the world, and as a member I can take classes in other countries free of charge! What a great perk for Canadian travel mamas! I have to confess, when I learned about the cost of Gymboree Play & Music classes my eyes popped out of my head! $85.88/month* plus a $40 one-time family enrollment fee (*Note: Class prices may vary slightly because it is a franchise)! WHAT?! That’s more than my gym membership (which includes free childcare, I might add)! I thought, “forget it”, but then something changed! Our daughter became super mobile, and living in a small home in a cold climate led to me sign-up! Since there are open gym times (free play without an instructor) during the week, I can actually spend 4 days a week at Gymboree, which makes the cost seem so much better (e.g., $6/outing)! Gymboree (the clothing company) is connected with the Gymboree Play & Music centres. *MAMA TIP* Go to the clothing store in person or online, and sign-up for a rewards card. It is FREE! With the card new members get $20 off their Gymboree Play & Music fees. Also, when you buy clothing from Gymboree during certain times of the year you can earn “Gymbucks” which also can be used towards the Play & Music fees. I have noticed that people offer their Gymbucks for free on classified advertisement websites like Craigslist and Kijiji, so search places like these and maybe you’ll get lucky! If you do sign-up for a Play & Music class then you get discounts on Gymboree clothing (usually 20% off). All the above may seem like an advertisement, but it isn’t. This is just me sharing how I am surviving the winter and avoiding being trapped in my home! I know Gymboree is a big financial commitment so continue to search out free play centres in your community too! I still take my daughter to the Ontario Early Years Centre twice a week (we are there so much she now squeals when we greet the employees)! What is your favourite indoor place to visit in the winter? 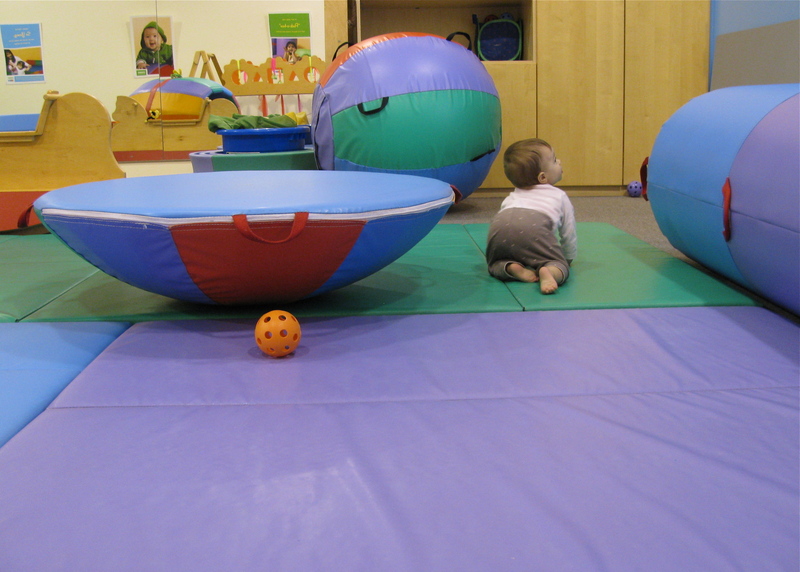 This entry was posted in playtime, travel and tagged crawling, Gymboree, play centre, winter. Bookmark the permalink. Ok, now I have to try the free one! Love your photos too :). It looks like lots of fun for the munchkin. Yes, I love that Gymboree offers a free trial class too, which I would suggest doing now that your little one is mobile! Also, Gymboree Toronto just announced on their Facebook page that during the month of February if exisitng members (hint: me!) brings a friend to sign-up for a class then both parties get $40 off their monthly fee! That is a huge savings! Let me know if you or anyone else is interested in taking advantage of this offer! Perhaps one day you can bring me, once mine crawl!! Shouldn’t be too long now! That’s too funny! I’d love to take you there! I love it because the whole room is padded so babies can take risks (like climbing) without getting hurt! Thanks for sharing all the info about Gymboree. I recently got a deal from livingsocial where it’s $49 for one month and no membership fee at a choice of two Gymboree locations. I’m looking forward to trying it out. Just wondering, which location is the Gymboree from your pictures? The LivingSocial deal is a very good value! I have visited both Gymboree locations in Toronto (and one in Notting Hill, London, England), but the photos above were taken at the Beaches location in Toronto. I hope you enjoy your Gymboree classes. I think the best time to start Gymboree is when your little one is on the go (either crawling with confidence, or just starting to walk).